A legal place for graffiti, an authorised graffiti wall seemed to many like a good idea, a dedicated space where young people can graffiti without causing problems to other people. The wall on the left is an example. An underpass in south Woodham Ferrers Essex is an example of a community project that involved local Graffiti artist Scott Irving from Brave Arts and the students from the secondary school and resulted in Rainbow Walk. And the designs painted were excellent. The only trouble is that the wall continued to be defaced by people adding their own writing, distorting the images and even damaging the wall by stripping plaster from it. 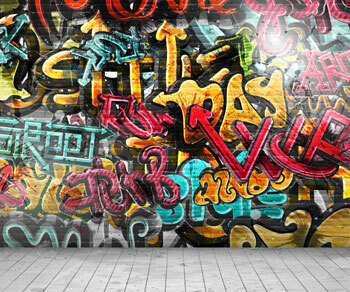 The sad conclusion that many have come to is that graffiti walls, as such, do not prevent always graffiti in other areas. Graffiti artists do not even respect examples of good art work on a wall. The problem is essentially a lack of respect. When we look at the graffiti around us, much of it is appalling rubbish. The real art is very rare. Any artist showing merit will be able to obtain genuine commissions (even if to cover the cost of paint) and people will welcome their art work. Once artists start accepting commissions or obtain permission to paint on a wall an element of control come in. The artist needs to agree the subject of the art work, size and perhaps even a date for completion. It becomes work. Illegal graffiti artists who damage other people's property do not concern themselves with pleasing anyone or even care about offending or hurting other people. They care only about themselves at that point in time. A young person may be going through a rebellious phase, anti authority or anti anything and everything. It takes all of us several years to grow up and we continue to learn all throughout our lives. Our views and beliefs alter as and when we are presented with more information. The graffiti artist of yesterday may become the brilliant graphics artist of tomorrow if he or she can find out how and have the desire to succeed. If not taught at home, it can take many years for people to come to the conclusion that a life lived in harmony with people around us is a happy life. Everyone is at different stages, everyone has different beliefs because of their personal experiences. Each of us is an ambassador through life, presenting an image to the world and the people who meet us tend to build their beliefs on what they see. If you behave badly, some people will assume that you are representative of your group. You have heard the saying 'give a dog a bad name and hang him' . For example, sensible people know that 'hoodies' are not all evil, just wearing a garment with a hood, but do be aware that you give people the image that you want them to have and image counts. You may wish to consider graffit used as an inspiration to attract young people.